Opened for bicyclists and pedestrians in 2016, the Central Marin Ferry Connection Project represents the culmination of many years of effort by public agencies and community groups to provide safe and convenient bicycle and pedestrian access across the very busy Sir Francis Drake Boulevard in Larkspur. The new bridge provides a separated bicycle/pedestrian connection from San Rafael through the Cal Park Hill Tunnel to the Larkspur Ferry Terminal and the Corte Madera Creek path. This project closes a critical gap in the North-South Greenway network and supports efforts to promote multi-modal transportation options, increase mobility, and promote active lifestyles. The project is funded through the MTC-sponsored Regional Measure 2 Program and Regional Bicycle Program, the County-sponsored Non-Motorized Transportation Pilot Program, ½ Cent Transportation Sales Tax Interest Revenue, and the Bay Area Air Quality District-sponsored Transportation Fund for Clean Air. Construction of the Central Marin Ferry Connector multi-use pathway required the installation of piers/columns within the tidal salt marsh and tidal channel of Corte Madera Creek. As part of the mitigation for this construction impact, the project is responsible for restoration and enhancement of approximately 1.42 acres of tidal marsh at Creekside Marsh adjacent to Hal Brown Park. The restoration project is near the City of Kentfield in an unincorporated area of Marin County. The restoration project will include removing an unauthorized trail and replacing the area with suitable soil and bay mud for establishing marsh vegetation. Replanting activities will include salvaged wetland vegetation and new plantings for mid- and upper marsh habitat as well as transitional and upland habitat. Monitoring will occur for five years to ensure effective restoration. 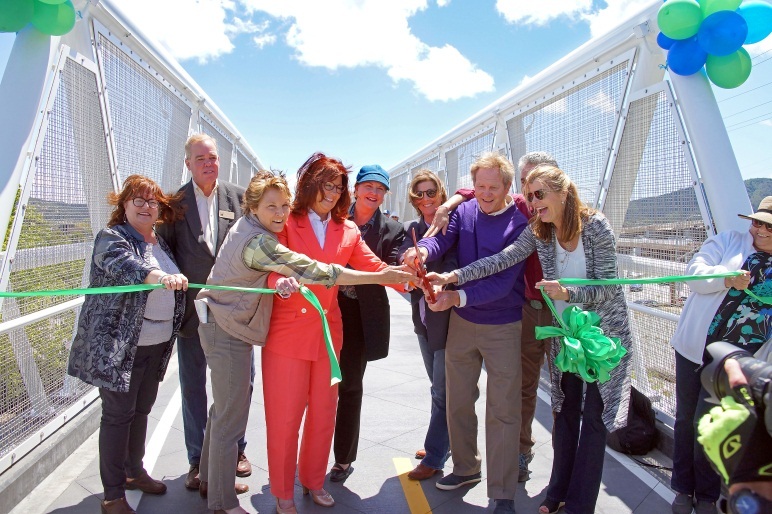 Ribbon-cutting ceremony at Central Marin Ferry Connection Project completion, May 20, 2016.